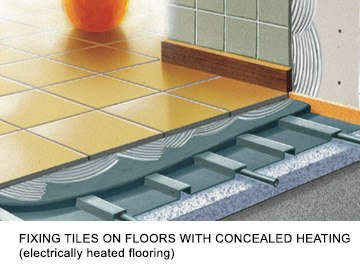 How to deal with the high thermal constraints of floors with underfloor heating? A) Installed under a screed or a floating slab complying with the CPT specification n° 3606. B) Impregnated in a suitable mortar subject to an AT technical authorisation. • If there is microfissuring of the concrete substrate: use CERMIFACE bond breaking system. • Finishing of joints: it is recommended to use CERMIJOINT SOUPLE or CERMIJOINT TX admixed with CERMILATEX. SUITABLE SUBSTRATES: Screeds and covering slabs complying with the CPT specification n° 3606. • Drying of the substrate: minimum 3 weeks. • Increase the temperature progressively. • Planeness tolerance: 7 mm under a 2 m ruler for normal consistency adhesive mortars, 5 mm under a 2 m ruler for fluid consistency adhesive mortars. -use RAGRENOV S30 for thicknesses from 3 to 30 mm under all types of covering. - Use RAGREROC RAPID for thicknesses from 3 to 10 mm under ceramic coverings or parquet flooring. Switch off the heating at least 2 days before fixing the tiles or applying the levelling mortar. APPLICATION AREAS: Refer to the manufacturer's AT technical authorisation. • Screeds, concrete slabs, etc. • Existing bituminous*, neoprene or vinylic adhesives. • Existing roughened paints* on concrete and cement* substrates with CERMIGRIP primer. SUBSTRATE PREPARATION Refer to the Technical Data Sheet of the product used. • Formats up to 10 000 cm2 with CERMIFACE combined with adhesive mortars classifed C2S1 of the DESVRES TOP PERFORMANCE* range. • Use a U9, E10 or E15 notched trowel, depending on the format (see Technical Data Sheet). • Allow for inter-tile joints of at least 4 mm or 6 mm, depending on the format.• Allow for the substrate joints. • Allow for a peripheral joint of at least 5 mm. • Use CERMIJOINT SOUPLE for jointing the tiles at least 24 h after fixing the tiles. • 2 days at least after doing the jointing. COATING OF THE HEATING FILM: use CERMIDUR, CERMIFLEX ALG, or RAGRENOV S30. Please consult us. • Use CERMIJOINT SOUPLE for the tile joints at least 24 h after fixing the tiles. • Wait at least 2 days after jointing.